Javelin Cabrio: The Traditional British Sports Car. Following the success of the original Cabrio and the Mk2 LWB car, Javelin Sports Cars Ltd are proud to announce the Mk3 Cabrio, now using BMW donor mechanicals, and still engineered by Marlin. All pictures are currently of Mk1 & 2 Cabrio's (as supplied by Marlin Cars Ltd), but the Mk3 is identical to the Mk2 bodily. Greengates, Bradford, West Yorkshire. BD10 0QZ. Fantastic New Cabrio Sports - Full Test Reports. Classic Sportscars. Javelin Cabrio - an outstanding alternative to a Cobra, Ferrari, TVR, MG, BMW, Morgan, Lotus Elise, Beach Buggy, Custom Car, Hot Rod, Lotus 7, Porsche, Westfield, Caterham or Trackday car. Just browse, enjoy our website & dream about our cars! Javelin Sports Cars - Javelin Cabrio, previously by Marlin, Marlin owners club. Marlin Cars - 5EXi, Sportster, Sportster TOi, Hunter, Roadster, Berlinetta, Marlin Racing . 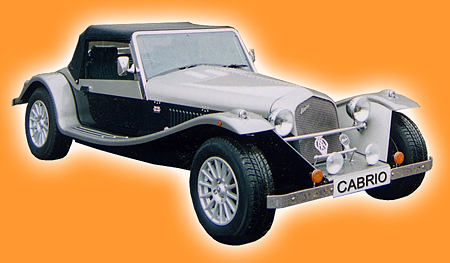 Alternative Car Manufacturers - YKC, DAX, JBA, Tiger, Morgan, Caterham, etc. Generic names - Specialist Sports Cars, cars, kit car, kit cars, component cars, sportscar, sportscars, car clubs, performance car, performance cars, fast cars, classic cars, classic and performance cars, top marques, car rally, car racing .